After a weekend beating up the 2010 World Champion Giants, the Nationals went into Philadelphia with high hopes. They had a .500 win record and had the confidence of Roger Bernadina. And then the Phillies handed them 3 embarrassing lifeless and shark-less losses, topping it off with a gruesome 7-3 trouncing last night. The Nats struck out 12 times in total including 3 from Layne NiKKKs. Shockingly, none of those strike outs came at RicK AnKiel's expense (because he is still out after jamming his hand). Injuries are not new to RicK AnKiel who has missed most of the last 3 seasons dealing with them. Right now, AnKiel is expected to be back soon, but if a DL stint is in order, we will hopefully see The Shark back in Nats red. We are now past the 30 game mark for the season, and the Nationals starting outfielders are batting .232 or lower. 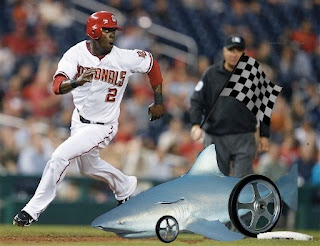 Based off the stats on www.baseballreference.com, I will now give you some comparisons between the Nationals current outfield and the Sharkplug that is Roger Bernadina. In 26 times more at-bats in the majors this season, Mako Morse (78 AB) has as many doubles as Roger Bernadina (3 AB). Roger Bernadina has as many assists (4) for the Syracuse Chiefs as RicK AnKiel, Jayson Werth, and Mako Morse have combined. Jayson Werth has infinitely more errors (3) than Roger Bernadina (0). Mako Morse has 18 hits in 26 games played for the Nats. Roger Bernadina has 19 hits in 19 games for the Nats and Chiefs. Roger Bernadina has hit into zero double plays this season. Rick Ankiel (2), Mako Morse (2), and Jayson Werth(3) have combined for 7. Roger Bernadina(2 games) has twice as many hits as Matt Stairs (18 games) has for the Nats this season. Roger Bernadina has a 7 game hitting streak. Mako Morse has 4 hits in his last 7 games. For the Syracuse Chiefs, The Shark has as many stolen bases (8) as RicK AnKiel, Jayson Werth, and Mako Morse have combined. Pay close attention to that last statistic. 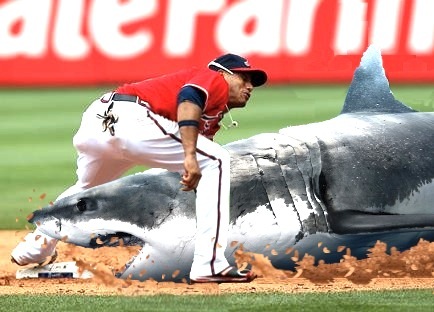 The Shark had 2 more stolen bases last night. Combined with Ian Desmond's apparent base stealing prowess, the Nats could be a running force to be reckoned with. The bull shark even had wheels! If a shark in the ocean is like a pickup truck in the water, I wonder what a Shark on the baseball field is like.